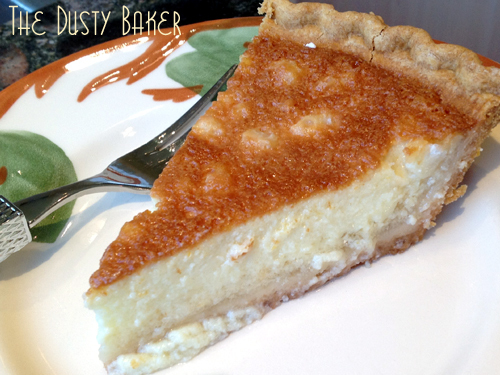 Grapefruit Sponge Pie: Burwell Recipe Swap! This morning I published this post with some whinging about being tired and un-creative. When I typed this post for the first time last night, my brain was beyond where wit and articulation are birthed. 24 hours later I’m still over-tired, but I don’t care. Because I’ve just gone through the recipes submitted by this Burwell General Store recipe swap group, and I’m rejuvenated. I love this group of swappers. I’ve participated in thist monthly swap, organized by Christianna at the Burwell General Store, for well over a year now. But then our group got too large, so we split in two, then got overwhelmed with our own lives, then took a break, then joined up again, and now here we are! We all write blogs for different reasons. We all read blogs for different reasons. But if you’re looking for creativity and all-things-yummy, you’ve come to the right place this morning. Just click on that little froggy below to see variations of one simple, very old recipe from a vintage cookbook. As I scrolled through the posts, pinning and commenting away, I met new blogging friends and reconnected with old ones. It was a truly delicious night. I was shocked that this worked! I just replaced grapefruit for the lemon and used the milk my boss can digest, and let some basic pastry knowledge lead to a more specific recipe than the one above. A light, spongy, fluffy layer of grapefruit-flavored custard-ness was on the table for breakfast today. It would do well for a dessert also, but on this steamy Monday with a house full of guests I’m cooking for in Amagansett, it did just fine. And click on the little froggy below to check out the other Burwell swappers in their, likely, more creative variations! Cream the butter, sugar and egg yolks until smooth and bright yellow. Add the flour, grapefruit juice and zest, and beat to combine. Slowly pour in milk and stir to combine. In a separate bowl, beat egg whites to soft peaks. Fold into mixture. Pour into shell and bake for 45 minutes, until set at the sides but still jiggly in the center. Cool completely before serving. I make lemon sponge pie all of the time — one of our favorites — but I have never thought to make it with grapefruit. Yum. I could have, but I was letting myself not adapt as per usual and bake it for the family I work for with their ingredients and preferences, since I’m working a trillion days in a row. And now that I know it works, I can adapt away for me! I DO use a LOT of eggs though… with gluten and dairy problems I don’t think I could live without them too! What a gorgeous pie, dusty – it looks yummy :D. Using grapefruit is a great idea. Thanks FF – and it fits under frugal feeding, right, at least in some way?!?! I never made a sponge pie. Yours look phenomenal! I think I should try it! I was WAY psyched with how it came out, actually. A relatively simple process I’m totally going to play with! You’re always witty and adorable, and this pie looks so ridiculously good. It sounds like you’ve been crazy busy, I’m not sure how you do it all! I hope you get some rest, and that you can sit down and enjoy a pie of pie. (Really, truly, this looks like the best slice of pie I’ve seen in a long time). Bravo, lady! Aw, thanks darling. I could sure use one of your popsicals right now though! Sweltering!!! Let’s make it a date?!?! your grapefruit sponge pie looks delicious Jacqueline and there is nothing wrong with a quick and easy dessert! Be careful on the mandolin, I have never been fond of them, too many of my own injuries! Yeah, the mandoline is a fickle friend. Perfect for when I have to thinly slice a trillion cucumbers for a cucumber-dill salad. Hellish and dangerous when slicing oblong veggies in a rush. Another lesson learned! look at you..double swapping! great job. I am so happy we are back together. looks like you made a perfectly delish and refreshing pie! Goodness I could eat the whole pie all by myself. Looks super delish.